What is your future impact? Researchers Acuna, Allesina, and Kording decided to use machine learning to find out. They recently published a Nature article, “Future impact: Predicting scientific success,” that describes their method and findings. Their goal was to predict a scientist’s future h-index given his or her current bibliographic data. I wrote about discovering the h-index two years ago. Nowadays, Google scholar will calculate this value for you. 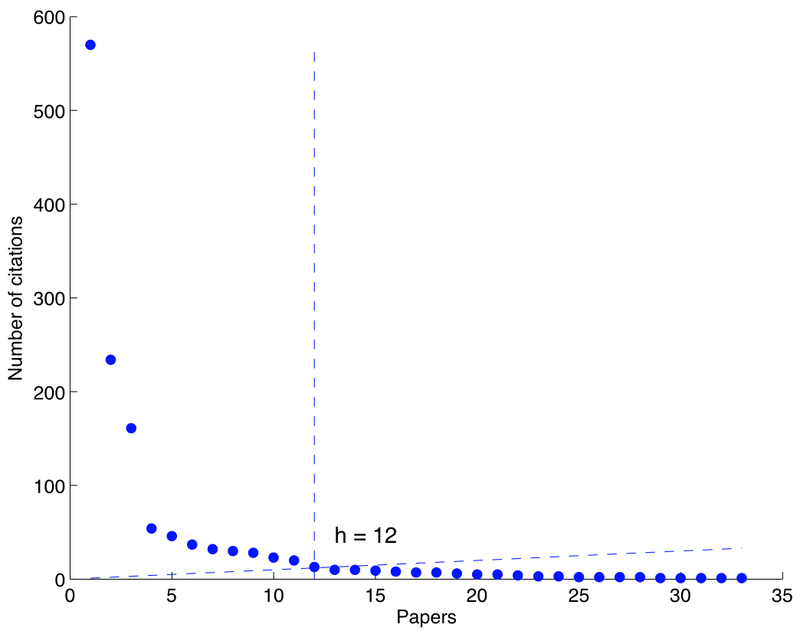 It’s a measure of research impact, characterized as the number h of your papers that have at least h citations. They found that this five-factor prediction did better at predicting the future h-index than just using the current h-index itself. Their R2 value for predicting h-index one year into the future was 0.92; five years out, 0.67; and ten years out, 0.48. Their conclusion was that raw h-index numbers were not as predictive as also capturing the scientist’s “breadth” (in j) and the quality of the publication venues (in q). There’s more than recreational fun going on here. The authors note that h-index values may be used in tenure decisions. In that context, the ability to predict a candidate’s h-index five years into the future could have even more impact—if it were sufficiently reliable. As usual, we can hope that such decisions are made with more than just these impoverished metrics in mind! A scientist has index h if h of [his/her] Np papers have at least h citations each, and the other (Np − h) papers have at most h citations each. According to the wikipedia entry on the h-index, that’s a decent score for use in “tenure decisions”, while getting up to about 18 might rate a full professorship. Of course, this is a coarse metric with (like all other simple metrics) its drawbacks. It doesn’t factor in the number of other authors on the paper, or whether the citations are self-citations, or how the paper is cited (in a substantive manner vs. a member of a long list of work cited in the introduction). But who doesn’t enjoy a moment of quantitative navel-gazing? Calculate away!